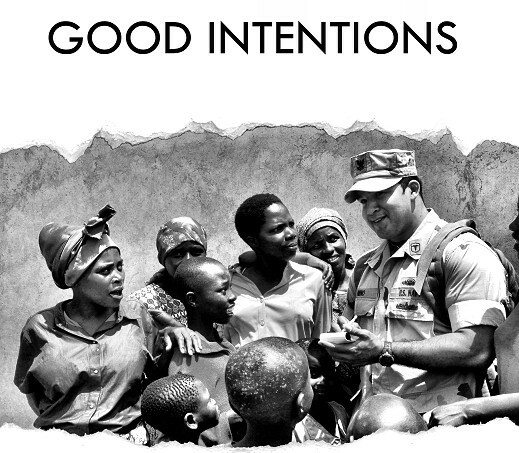 Good Intentions: Norms and Practices of Imperial Humanitarianism is the fourth volume in the New Imperialism series published by Alert Press, and it has just been released in hardcover, paperback, and in a couple of free versions online (a simple PDF, a bookmarked PDF [also here], or individual chapter files as below). In addition, over the next days and weeks, key sections from this book will be featured on this site. i) that we encourage and tolerate a broad range of views, and do not narrow down discourse to a select few allowable perspectives. These myths and a few more form part of the orthodoxy of what is now a post-liberal society. It is thus with honour and pleasure that I present the salutary works of advanced research students who have dedicated themselves to questioning these dominant “truths,” and who are also willing to share their work to better inform a wider public. The chapters presented here stemmed from a seminar on the New Imperialism, offered in 2014 in the Department of Sociology and Anthropology at Concordia University in Montreal. Each chapter went through several stages of planning, drafting and revision and reflect theoretical, analytical, and empirical mastery of their respective subjects. Taken together, the chapters have multiple, valuable considerations and revelations to offer the reader. Whether it is iatrogenic violence, voluntourism, homonationalism and the misappropriation of gay rights, or NGOs serving as the Trojan Horses of US dominance and neoliberal social reengineering, contributors to this volume expose and analyze the many ways in which the new imperialism involves partitioning the world into tutors and wards, saviours and victims. Underlying the seduction of imperial elite-lore are established modes of socialization and enculturation, ranging from the elaborate and persistent demonization of chief opponents of US empire to the lionization of military actors commonly rendered as heroes. Also scrutinized in this volume are the domestic social and political costs, reaching as far as the displacement of urban populations to make way for the expansion of the informatic industries of empire, paving the way for the unprecedented dominance of corporations in our daily lives. A final question lingers in the background throughout this volume. How much longer will we continue to buy into projects proclaiming “good intentions”? In Part 1, chapter 1, “Iatrogenic Imperialism: NGOs and CROs as Agents of Questionable Care,” Émile St-Pierre examines the role of NGOs and Contract Research Organizations (CROs) in the formation and propagation of a neoliberal paradigm in health care. As St-Pierre explains, neoliberal policies beginning in the 1980s forced many states to retract from health care provision. NGOs and CROs have emerged as gap fillers in the wake of these policies. The activities of NGOs and CROs in conjunction with states and pharmaceutical corporations produce changes in the everyday lives of people, offering new possibilities for some at the same time that they dominate and classify populations in new ways. NGOs, CROs and the actors they are tied to, rely on patterns of illness and inequality to continue existing, and securing revenues. Iatrogenic imperialism is used by St-Pierre as an analytic to bring to light the way “good intentions,” expertise and humanitarianism play into efficiency-driven, neoliberal configurations of health care that fail to produce benefits for all, that undermine public health systems and that tend to reproduce global inequalities. In exploring the roles of lesser-known but increasingly important actors in health care worldwide, St-Pierre’s research critically analyzes some of the newest phenomena in the neoliberal turn health care has been experiencing and speaks to their penetration into the everyday lives of people. In chapter 2, “US Imperialism and Disaster Capitalism in Haiti,” Keir Forgie details some characteristic actions of the new, that is, US imperialism enforced upon Haiti leading up to and following the earthquake of January 2010: military and CIA intervention, the UN-administered MINUSTAH occupation, US-funded NGOs, the militarization of humanitarian aid. These tools of disaster capitalism are all part of the new imperialism, Forgie argues. The US military and CIA have repeatedly intervened against Haitian sovereignty to impose US “democratic” systems that favour neoliberalism. Meanwhile, MINUSTAH enforces US objectives repressing free-speech and effectively acting as a large gang, one opposed to supporters of the overthrown president, Jean-Bertrand Aristide. NGOs, for their part, provide a means through which the US can funnel aid money and pursue self-interests while undermining local authority. In addition, the militarization of humanitarian aid in Haiti exemplifies a masked occupation under the guise of altruistic rhetoric. And as Forgie argues, predatory impositions of neoliberalism and corporate interests that pushed through disaster capitalism serve to subvert Haiti to a US means of production and sponge for capital overflow. Each of these coercive methods ensures US hegemonic globalization, acting as distinguishing features of the new imperialism, Forgie explains. In chapter 3, “Who Needs Me Most? New Imperialist Ideologies in Youth Centred Volunteer Abroad Programs,” Tristan Biehn examines the new imperial ideologies present in narratives manufactured by the websites of youth-centred volunteer abroad organizations. These narratives serve to instil neoliberal, capitalist understandings of the issues of global inequality and poverty in prospective volunteers, resulting in the depoliticization and decontextualization of such issues. Biehn finds that ideas of “change” and “good” are ubiquitous and yet are left undefined, that claims of “helping” and “immersion” are questionable, and that the utility of international student volunteering lies not in the benevolent donation of unskilled western youth labour to underprivileged communities, but in the production of ideal neoliberal subjects. The nebulous concepts of help and change are commodified and made the responsibility of individuals—the prospective volunteers—who are inundated with the message that actions taken to end global inequality will also benefit them personally. As Biehn explains, such programs contribute to the neoliberal project of redirecting efforts from the pursuit of larger structural changes or solutions to these issues. Chapter 4 by Hilary King which is titled, “Queers of War: Normalizing Lesbians and Gays in the US War Machine” is a very welcome addition to the subject of gender, sexuality, and corresponding ideas of rights that we first introduced in Volume 3 (see Pas, 2013). In her chapter, Hilary King begins by noting how at a recent Human Rights Campaign (HRC) gala in Los Angeles, US Vice-President Joe Biden, the keynote speaker of the evening, claimed that the rights of LGBT people are an inseparable part of America’s promotion of human rights around the world. This speech exemplifies the ways in national sovereignty, and whether or not any nation is deserving of it, has come to be decided by the extent to which a given nation accepts the gay and lesbian subject, King points out. In the past decade, the US has become a vocal advocate for the legal rights of LGBT subjects. Through the careful governance of liberal mentalities, as King explains, the appropriation of these rights by the US government has heavily aided the US in forwarding its imperial war machine. By relying on Jasbir Puar’s theoretical framework of “homonationalism,” King’s chapter looks specifically at the Matthew Shepard and James Byrd, Jr. Hate Crimes Prevention Act, the repealing of Don’t Ask Don’t Tell (DADT), as well as the HRC, in order to explore the ways in which sexuality has become a formation in the articulation of proper US citizens. One of the defining features of the existence of a global dictatorship (hegemon and superpower might be too “soft” in this “human rights era” of invasions and occupations), is where one state gets to set the rules by which others live, while raising itself above those same rules. This leads to the idea of the practiced reality of “American exceptionalism” as an aspect of the global state of exception imposed by the US—two “exceptions” in one, combining both the ideas of emergency and primacy. In this respect, chapter 5, “The International Economic Sovereignty of the United States of America: Integrating the Exception to our Understanding of Empire,” by Karine Perron, addresses the scope of US capacity to influence and set out rules for international economic policies, rules which it then ignores. By examining cases concerning the IMF, the WTO, and even the overthrow of governments, US advocacy of capitalism, free trade, and democracy, each is contrasted with situations in which the US made exceptions for its own benefit. The significance of US power to decide on “the exception” is discussed by Perron in relation to the strategy of enlargement openly promoted by the Clinton administration and pursued by subsequent US governments. As economic growth has been added to the US definition of national security, exceptions have become a permanent feature of American foreign policy. Using Schmitt’s definition of sovereignty as the power to decide on the exception, Perron argues that this capacity of the US to decide on exceptions regularly in the international economic realm is significant of its international sovereignty, and its intended supremacy. In these respects, Perron is raising some critical points of interest similar to those of Scheppele (2013): with respect to international law, what the US does by erecting itself as an exception is to create a rule from the exception. The US works to distribute this law, and uses its rule to extract and centralize gain. What Perron also does, like Scheppele (2013), is to pay respect to the fact that apart from a brief period when economic globalization seemed to reign supreme, powerful states (such as the US) have proceeded to seize back much of the power they had allegedly lost or ceded. A demonstration of the synergy between corporate empire and US empire takes us to the next chapter. In chapter 6, “Life, Liberty and the Pursuit of Wage Labour: The American Legislative Exchange Council and the Neoliberal Coup,” Mathieu Guerin produces a fascinating investigation and theoretical discussion of the American Legislative Exchange Council (ALEC), a not-for-profit organization that brings together corporate representatives and state legislators—thus “marrying” both capital and the state. Behind closed doors, Guerin reveals, the representatives and legislators design and vote on model bills. Legislators then bring the model bills home to their respective assemblies and attempt to implement them. The corporate members of ALEC are, in this way, empowered to change citizen’s rights without interference from the federal government. By fostering close ties with state legislators, these corporations have the power to impose their vision of society without recourse to military or police violence. Guerin also investigates the connection between the character of gentrification in San Francisco and the bullying might of Silicon Valley’s ALEC-affiliated corporate technocracy. This case study demonstrates how capital co-opts the existing state structure as a mode of subjugation and repression. Guerin’s research and analysis conclude that ALEC is an organization that symbolizes a corporate imperium rooted in the rise of neoliberalism in the early 1970s and emerging within the established imperial state of the US. An in-depth look at the infamous Powell memorandum reveals an imperialistic ideological continuity between its conception in 1971 and ALEC itself. John Manicom’s “The Terrorist, the Tyrant and the Thug: ‘Anti-Anti-Imperialism’ in American Media and Policy” (chapter 7), is a powerful examination of the discursive and narrative practices of US politicians and media with regard to non-US opponents of US power. These US actors generate catastrophizing discourse classifying phenomena in politically advantageous ways and seeking to arouse certain reactions to events. The types of evaluations and reactions that occur in this discourse, Manicom observes, are relatively predictable and based on the subject’s level of cooperation with US power. The most negative evaluations are assigned to states and sub-state groups which actively oppose US power. Mainstream western media operate from similar ideological perspectives to governments and benefit from a privileged discursive position in society allowing them to produce knowledge seen as generally legitimate, as Manicom demonstrates throughout. Their practices thus help to enable and sustain the narratives of politicians in demonizing and dehumanizing opponents and thus legitimating the often brutal practice of US interventionism. Chapter 8 by Laura Powell, “Glorification of the Military in Popular Culture and the Media,” fits well between Manicom’s and the final chapter of the volume. In this chapter Powell argues that while our military members are generally perceived as heroes, this romanticized perception of the military is more damaging than it is helpful. The mainstream media are part of the problem, Powell shows, as news coverage of conflicts is often incomplete or wrong, and based on an idealized version of the military as an unstoppable humanitarian force, while failing to discuss the terrifying realities of war. The Pentagon-Hollywood union also helps propagate this distorted view of the military. Perpetuating this view of the military works to disadvantage the men and women affected by PTSD as a result of their deployments and, Powell argues, attracts potential recruits who may not be aware of the dangers associated with enlisting. In some respects then, Laura Powell is furthering this seminar’s long-standing interest in “militainment”. On that note, my chapter 9, “A Flickr of Militarization: Photographic Regulation, Symbolic Consecration, and the Strategic Communication of ‘Good Intentions’,” is based on a study of the US Department of Defense’s Flickr photostream, from 2009 through February of 2014, examining a total of 9,963 photographs (with some key examples reproduced in the chapter), and two dozen US military directives, manuals, and guides on public diplomacy, strategic communication, social media use, and photography. Having said that, the analysis is not a quantitative one; instead, the project builds on Pierre Bourdieu’s ideas about regulated images, consecrated works, and the objectification and codification of (militarized) values, as well as the works of a number of visual anthropologists. Rather than an activity that expresses the randomness of individual imaginations, US military photographs register a pattern that reflects the prevailing political norms of a given social order. The patterns to be found among these thousands of images is in fact quite regular, and makes a series of clear points. This public engagement is carried out by the Pentagon with a belief that a major part of “the battle” is a “battle of the narrative,” one that takes place in the public’s “cognitive space,” in what is has been termed “Fourth Generation warfare”. These photographs are intended to represent the US military as a humanitarian, charitable organization, working among many communities around the world that are populated by (unaccompanied) children who are only too happy to be vaccinated and to skip rope with US soldiers. Female US soldiers have smiling close encounters with little girls, or cradle babies. When not displaying pure, motive-less good intentions, the photographs also produce a celebration of the awesome power and sophistication of US military technology: jets flying in formation, shiny drones illuminated at night like alien UFOs, lines of massive ships at sea, etc. Yet, there are virtually no images of actual combat. The photographs collectively portray a world rendered frictionless by the speed and ubiquity of American power and technology. In addition, by being studiously depoliticized, the photographs produce a political effect, for political purposes—they do not tell the horror stories of war, of blood shed and lives lost, of destruction and grief, but rather portray something like a birthday party, with a cycle of endless family reunions. However, as the Pentagon understands that every action is potentially a message, and there is an unresolved tension between “perception effects” and military planning, strategic communication in the form of disseminating photographs through social media faces ultimate pitfalls. sounds like an interesting new angle to explore from this series. Looking forward to reading it!